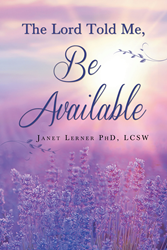 Recent release “The Lord Told Me, “Be Available.” from Page Publishing author Janet Lerner PhD, LCSW highlights the importance of having faith in oneself, so that any dream can be accomplished. Janet Lerner PhD, LCSW, a former housewife, turned hippie, turned social worker, has completed her new book “The Lord Told Me, “Be Available.”: an intriguing recounting of the author’s life, from her humble beginnings, to finding religion, and to accomplishing both educational and professional pursuits. Published by New York City-based Page Publishing, Janet Lerner’s revealing work invites the reader to glimpse into her life to find inspiration for their own. Lerner started as a country farm girl, who grew into a woman that married but did not feel like a housewife. She got divorced, got into trouble, went back to college to become a social worker, and went through the ’70s as a hippie. At the end of the ’70s, she was born again and went back to school to get a master’s degree at the same university as her bachelor’s—Ohio State. She was later accepted into Columbia University School of Social Work and received a doctorate in social work research. When she finished the social work program, she wanted to go back into the field of drug treatment, as she felt this area needed as much expertise as possible. Since then she has been blessed to develop and obtain funding for many drug treatment programs and other supportive services, which have been widely beneficial for the patients she serves. Readers who wish to experience this inspiring work can purchase “The Lord Told Me, “Be Available.” at bookstores everywhere, or online at the Apple iTunes store, Amazon, Kobo, Google Play or Barnes and Noble.